Both men in the title were large presences in the worlds they inhabited, and likewise enjoyed the continued company of other men of equally over sized personality. Schultz gives an accurate , vivid and swift accounting of the relationship between Mailer and Buckley, summing up their world views , their similarities and differences handsomely, but there is not much here in the way of literary criticism or speculation. Schultz's thesis, that both writers represented conflicting movements in the culture, the stalwart Right battling off the revolutionary Left, is a shaky at best.Buckley, though, was the leader of a movement, the Conservative Movement, which he was instrumental in founding and organizing with his publication The National Review and his program Firing Line. He used the NR platform to formalize a philosophy that charged thousands of younger conservatives into getting involved in politics, their greatest triumph being the election of Ronald Reagan.Mailer did co-found the Village Voice, of course, but sold his stake in it to finance his films, and was, unlike Buckley, a political wild card. He sided with the left on many a cause and belief, but there was a stubborn conservative contrarianism in is viewpoint, a quality that made him fascinating as a writer and thinker but, shall we say, unstable as an ally, let alone leader of anything.His treatment of both writers is, I think, much too worshipful . This is precisely the kind of subject that makes you wish the late John Leonard were still with us in order to take apart , inspect and comment upon the public utterances and behaviors of Bill and Norm and render a judgement as to how both men, as thinkers, will be effected by the eventual and brutal judgement of history. 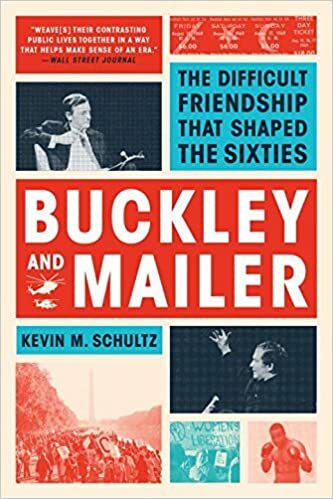 But for those fascinated by the culture, art and politics of the 50s and 60s, certainly a combustible era for America, Buckley and Mailer is an informative, if terse, recounting of the doings of two of its most interesting white men.